Bottled. Yellow coloured. Unclear. Off white dense head. Light fruits and some vague sweetness. Fruits, light grape and vague sweetness. Thin bodied. Quickly dying on the palate. Very boring and bland beer. Bottle. Milky yellow colour with a big white head. Acid, light citrus aroma and a discusting fruity taste. Medium body with a fruity finish. Bottle. Hazy yellow coloured with a white head. French aroma of spices and fruits with notes of corn. Flavour of spices and corn. An unclear orange beer with a huge white head. The aroma is sweet wheaty with light notes of apples. The flavor is sour wheaty with a slight fruity touch, and a thin body. Clean (?) 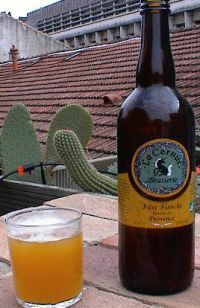 blond color, eggwhite head; the bottle has a disgusting amount of yeast sediment below the cap. The aroma has some hop and yeast. The body is weak, no malt, no wheat, no hop, just some yeast and iron (blood). Doesn’t even seem beer. Hazy orange, medium-sized white head. Nose has sugar, toffee, cardboard, wheat and banana. Dry mouthfeel, dry wheat flavors. Not sweet at all, like tasting paper. Light to medium-bodied. Quite interesting, certainly an unfiltered beer. Opened with a flowing foam. Hazy apricot colour. Wheat flavour - softly spicy. Well rounded and pleasing. Least infected of the Cornue beers.